Healthy Breakfast Foods, Ideas and Recipes that Promote Weight Loss. Choosing the right healthy breakfast foods can make a huge difference of how you feel during the day. Of course how you choose will depend on several factors. We all need energy to help us start the day and get into our daily tasks. For instance there are many of us who work in front of a computer all day and there are others who perform hard physical labor all day such as construction workers. 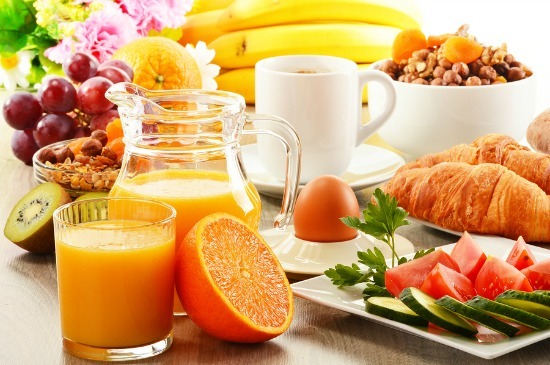 Healthy breakfast foods are important for all of us but depending on what you do during the day we have to take the portion size (amount of calories) into consideration. It’s a reality we all know too well, that when we sit our calorie burning is at a minimum and when our bodies are in motion we burn a lot more of them. There is one simple addition that can play a huge impact on one’s body and it’s so simple to do. Before eating your breakfast there is one beverage you can drink (before eating or drinking anything else) that can help cleanse and detox the body. If you can drink a glass of warm lemon water with cayenne pepper first thing in the morning and wait about 15 minutes (to help detox) the benefits you will experience will be amazing. The reasons for this are simple as water hydrates us, helps carry nutrients, detoxifies the body, and increases your metabolic rate. It also plays a huge role in weight loss and is necessary for the body to run efficiently. Lemon, cayenne pepper and ginger are all mild stomach stimulants that help the stomach produce lots of digestive juices that are needed throughout the day. Also lemons have a list of health benefits which include being loaded with antioxidants. This beverage improves liver function which helps us detox, increases our metabolism and helps with weight loss. What an incredibly healthy way to start the day and it is so easy to do. In a glass of distilled water (about 6-8 oz) add the juice of ½ a freshly squeezed lemon. Enjoy hot, warm or cold (though the human body prefers warm or room temperature the best). Add a pinch of cayenne pepper (you can also add a pinch of freshly grated ginger if you have any). This drink can be sweetened to taste delightful. Honey or maple syrup is a wonderful choice but if you are worried about calories than use a sweetener such as Stevia or Agave. This beverage is like a mini morning detox. So after enjoying this beverage try to wait about 15 minutes before eating or drinking anything to help your body do a little mini detox. If you find that 6-8 oz of water is too much first thing in the morning, then decrease the water and the amount of lemon juice to your liking.